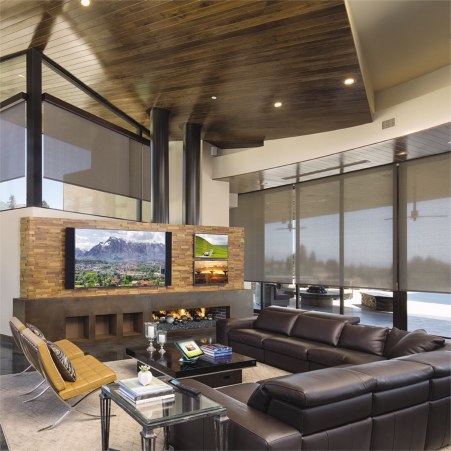 Crestron Home Automation integrates all of your favorite technologies into one easy-to-use system that makes everything work together seamlessly. There is a simple reason why Crestron is the undisputed leader of the home automation industry – we deliver the best user experience by far. Crestron is the one and only company that designs, manufactures and supports the full spectrum of home automation products and solutions to ensure unparalleled performance and reliability for you and your family. Our mission is to provide you with the best possible user experience is at the heart of everything we design. Touch Screens - Control your environment with beautifully designed, easy to use touch screens- control lighting, adjust the temperature, put on your favorite track all at the tap of a button. Audio - Creston makes entertaining truly effortless. Set the mood for the party with one touch. Want different music playing in the kitchen than in the dining area? It's easy with Creston in your home. Lighting Control - Once the day's done, set the perfect scene for a family dinner or to snuggle up for a movie, as the screen drops, the lights dim and you settle in for a perfect evening. Security - Keep a closer eye on your home. Creston gives you the freedom to control your security and monitor cameras remotely, promising ultimate peace of mind. Remotes - Communication control, entertain, play - at the touch of a button you have the ultimate in home control. Video - Creston takes your viewing experience to a whole new level. Whether you're watching your favorite show on cable TV, streaming a blockbuster movie, or playing a cutting-edge game in 4K Ultra HD, one touch ensures the screen you're viewing is optimized for whatever content you choose. 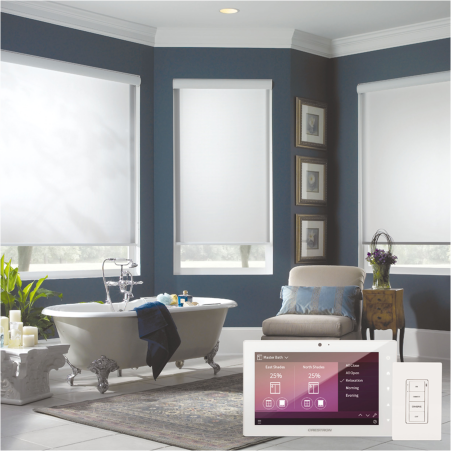 Shades - Creston motorized shades and drapery systems transform any room into a more spectacular space. Our stunning designer fabrics, elegant hardware, and world-class technology ensure you find the perfect shading solution for all the windows in your home. Climate - See the perfect temperature, always. If it's cold outside, your home will adjust perfectly to keep you warm or if it's too hot set the climate to cool intuitive, sophisticated climate control for every season. Whether you’re there for a great meal or great conversation, a beautiful kitchen is the central gathering place of today’s home. 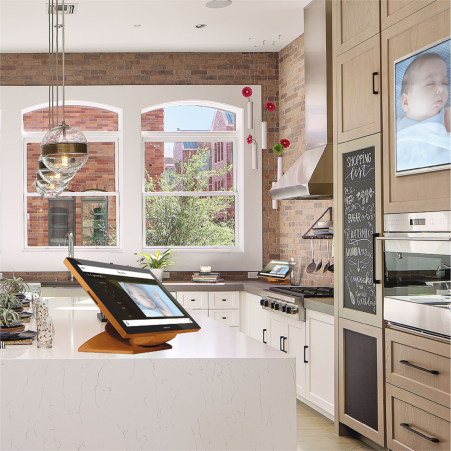 Only Crestron connects your kitchen with the entire home to make it more comfortable, convenient and entertaining. From one brilliant touch screen you can see, hear, and control all of the Crestron technology in your home. Check the weather or lookup a recipe as you listen to your favourite music; you can check security cameras, turn lights on and off around the house, adjust the temperature, let in a guest, or even watch TV right on your touch screen. Crestron technology truly gives you all-in-one seamless connectivity in the heart of your home - the ultimate experience. Crestron technology blends artfully into the background, but it’s always ready to respond to your needs. 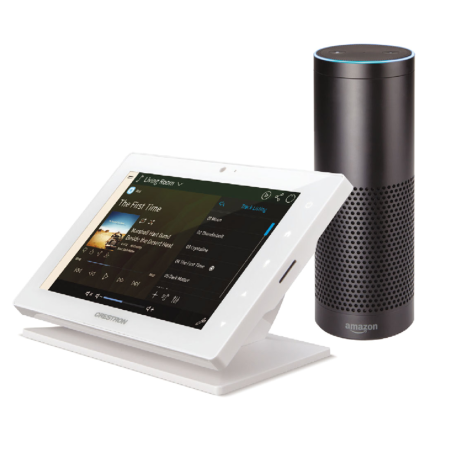 You can dim the lights, lower your gorgeous shades and turn up the music with your Crestron handheld remote, or take command of your system with your voice using Amazon Alexa. We take voice control to an awe-inspiring new level no other company can match; easily activate pre-set scenes, adjust settings to specific levels, or say more general commands like “I’m cold” or “It’s too dark” to have your Crestron system raise the temperature or turn up the lights. Whatever you need, just say the word with Crestron. Just as fresh flowers and fine linen add beauty to the table, Crestron enriches your dining experience with fine-tuned control of lighting, shades and music. 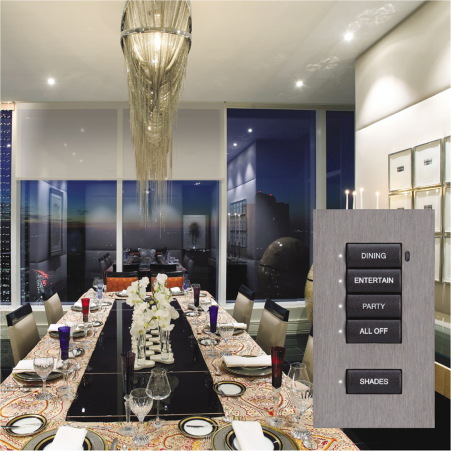 A Crestron designer keypad or touch screen is all you need to create the perfect ambiance for any occasion, whether it’s an intimate dinner for two or a festive family celebration. Thanks to convenient pre-set scenes, such as “Family Dinner,” you can even set the mood with a single tap. Because Crestron makes all of the components in your system, there’s never any delay waiting for controls to respond – your lights dim instantly, shades adjust silently, and your favourite artist starts playing through our high-performance speakers. All that’s left is to sit down and enjoy your meal with family and friends. At the end of a long day, settle into the comfort of your bed and let all your stress melt away. 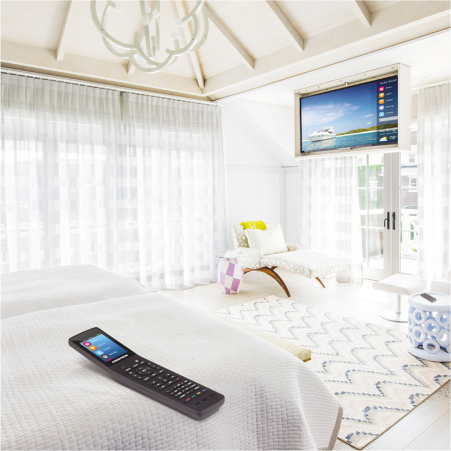 Control more than just the TV from a Crestron handheld remote. Select “goodnight” to turn off all the lights in the house, turn on the camera outside the front door and adjust the nightlight for the kids. You can even make sure that all the shades are drawn and the temperature is set back without getting out of bed. The power of Crestron truly means you can relax knowing that you are in complete control. Crestron simplifies home theatre control to make your movie night look, feel, and sound like a star-studded world premier. 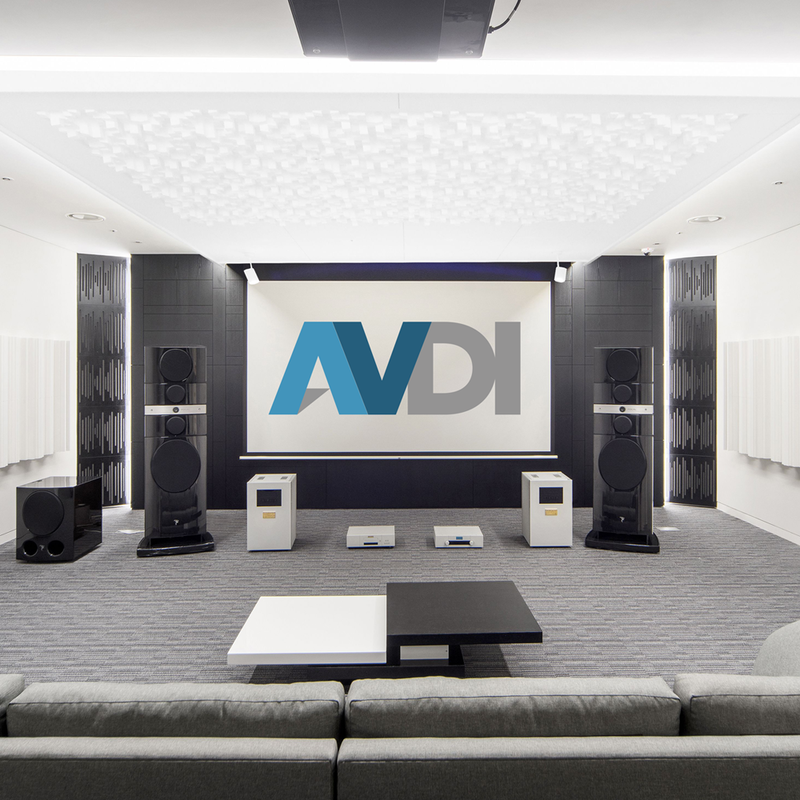 Whether it’s adjusting the speakers, viewing the highest definition movie content, or choosing to watch 4 football games at once, our end-to-end technology provides an easy and exhilarating experience for everyone. While lesser theatre systems combine products from multiple manufacturers and require a Ph.D. to operate, with Crestron you can immerse yourself in gorgeous movies, exciting sports, or cool gaming with just one touch. Turn your personal oasis into a true paradise with Crestron control that anticipates your every want and need. As the sun sets, the pool lights turn on automatically and the landscape lighting gradually ramps up. With your waterproof Crestron remote you can change the channel on your outdoor TV, choose your favourite playlist or adjust the jets in your hot tub while enjoying a well deserved soak. 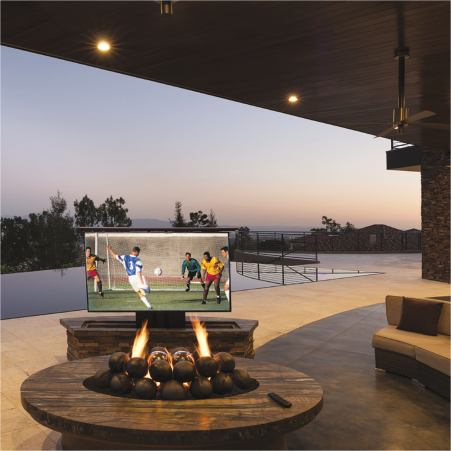 With Crestron managing the great outdoors you now know that complete and unparalleled control inside and out is yours. Keep your finger on the pulse of your main residence and your other properties or marine vessels with the one and only Crestron app. Turn up the heat before you arrive home on a chilly night or let in a guest to your beach house while sitting in your office. You can check security cameras, turn on sprinklers, adjust the lights and shades and much more. 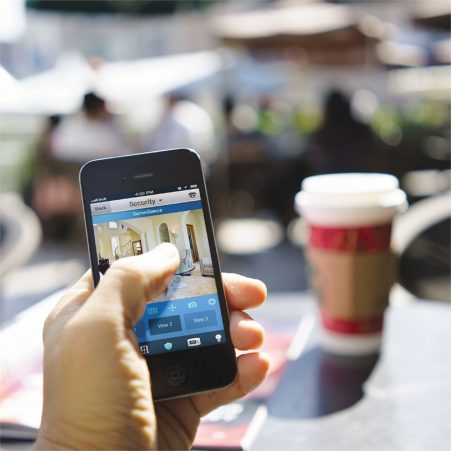 Your Crestron systems are always at your command wherever you happen to be. Crestron is the only company that offers you unlimited customization, giving you total freedom to personalize every space. It starts by offering the widest range of design choices. Whether it’s our stunning selection of designer keypads, or our popular signature series touch screens, our solutions blend in to any design to complete your vision to perfection. Not only does everything look great, we make it easy to create custom scenes and schedules that orchestrate your lights, shades, music, video, security, temperature and other technology exactly to your taste. No other company compares to Crestron when it comes to delivering a personalized home automation experience that reflects your one-of-a-kind lifestyle.